Timed to coincide with the World Serviceâ€™s focus on China, this weekâ€™s programme scratches the surface of the countryâ€™s music, about which I am shockingly ignorant. Paul Fisherâ€™s compilation, The Rough Guide to the Music of China, is a wonderful crash course that starts back in the 1930s and comes right up to date. I could have just set it to play and said a few words in the gaps. But I like to make my life harder than that. 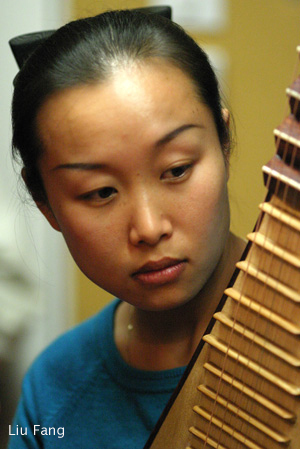 Two of our six tracks feature sophisticated instruments unique to China played by young women based in North America, the gu zheng (zither-ish) by Bei Bei, and the pipa (lute-like) by Liu Fang, who now live in USA and Canada, respectively. The other four are all East-West hybrids, starting with Gong Chio Xia, whose song from the 1930s sounds like something the Andrews Sisters might have done. Demonstrating the range of music to be found on The Rough Guide to China, Kin Taii is based in Japan where his combination of ancient and modern results in a sound reminiscent of Makoto Kubataâ€™s Blue Asia. Dadawa and Sa Ding Ding are young Chinese women who controversially but very effectively frame Tibetan texts and melodies with modern production. Last edited by Charlie on Wed Oct 10, 2007 5:52 pm, edited 4 times in total. The Silk String Quartet had some great ensemble playing at Womad this year, the pipa player was outstanding to my ears. I also think they have a recent Cd out on Arc label which is probably worth checking out. Last edited by Chris P on Wed Oct 10, 2007 4:18 pm, edited 1 time in total. I do love hearing these instruments in their unadorned state and watching them being played just adds to the pleasure. What brought the pipa to my attention was a track, I See Who You Are, on Bjork's Volta, where Min Xiao-Fen adds some pipa to the electronics, which works very well indeed. Can't wait to hear this show. Where can I buy some of the CDs from today's programme (13/09/07)? Don't seem to be stocked in the usual places in the UK. Thank you for your wonderful programme. Please, where can I find Da Da Wa's Seven Days album? I heard you for the first time Sat, Oct 13. I had to work late and for the entire show I was uninterrupted. I thought my co-workers might object except those from Asia! I will listen again and again. I'm now tuning in to the latest programme on 17760kHz of my shortwave radio with a good reception. Great to hear my name - Chun-Quan Meng - being mentioned in the programme. I turned on my radio at 0745utc when the programme's aired for nearly 15 minutes. I'll enjoy the whole programme online in the near future. Another BBC's "China Season"'s come! Wonderfully, Chinese music's highlighted in your programme. I enjoy them very much. I'm very much looking forward to tuning in to the next World of Music. I really enjoyed the music selections from China on last week's program. I often find myself turning the radio off after hearing a snippet of the songs for the show's lineup, but this time, I listened all the way through. It was most enjoyable. Just one question-when are we going to hear anything from Japan or Korea? I loved your programme on China, I have so many old tapes given me years ago by a Chinese friend that I used to play endlessly as I love their traditional instruments. I was also delighted to see (won't say fans...it's such an immature word) friends of your programme jump to your defence when that person on Over to You complained about too much music on the WS. Your musical fare is such a delight compared to some of the dunga-dunga drivel we get on the many stations available to us up and down the dial. It is...to use a cliche, an oasis in a desert of (mainly) bad news and bad music. Long may you rule the airwaves. Last edited by Charlie on Sun Oct 28, 2007 10:07 pm, edited 6 times in total. Great show. I've fallen hopelessly in love with Sa Ding Ding but correct me if I'm wrong the CD hasn't currently got a British release? Des wrote: Sa Ding Ding... correct me if I'm wrong the CD hasn't currently got a British release? It supposedly had a release date of 8th October but there may have been a slight delay - Wrasse told us there had been a little hold up on stocks and Amazon currently show it as "available in 5-10 days". Robin Denselow gave it a thumbs up in the Guardian on Friday, and when the new fRoots finds its way to subscribers through the post strike delays you'll find an interview with her by David Hutcheon. Loved the programme on China (and the recent one on Mali - truly excellent). The show works best for me when there's a theme.